I've moved my sites to new hosting and now trying to reconnect the User databases. I get the message there was a sync problem! 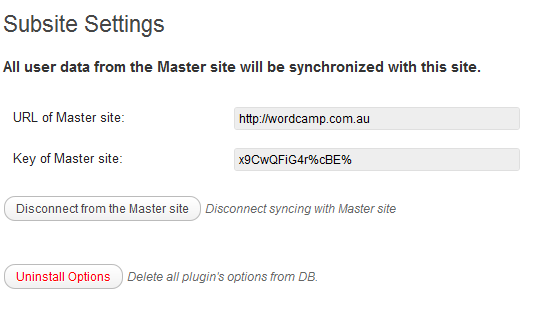 Can you try uninstalling User Sync Plugin (using this option for it https://premium.wpmudev.org/wp-content/uploads/2011/09/sync_discon.png ) and then make fresh install and try syncing again? Hi. I uninstalled/installed and the sync is working. How do I turn the debug off now? Only option to disable debug is by clicking the Uninstall Options button, and disconnecting the existing sync connection. Then create a new sync connection with debug mode checkbox unchecked. There isn't any other option to disable debug mode without disconnecting the existing sync settings made.